"Poverty, Progress and Puzzles in African Agriculture" Chris Barrett, SB&JG Ashley Professor of Applied Economics, Cornell University. 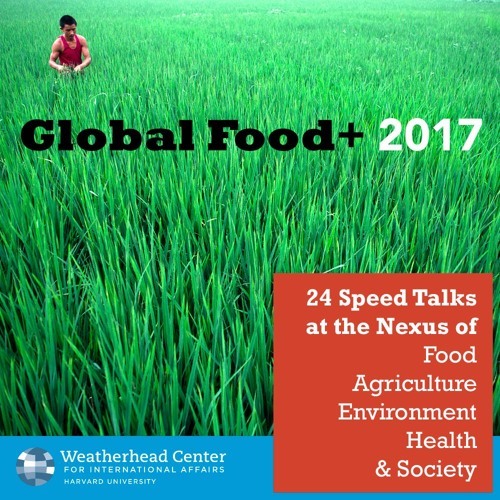 Global Food+ 2017 was a public event held on February 24, 2017 that featured an afternoon of “speed talk” presentations by two dozen top scholars in the Boston area. This event highlighted current research findings at the important nexus between food, agriculture, health, society, and the environment. The twenty-four presenters included scholars from a wide range of disciplines, including anthropology, economics, political science, history, sociology, engineering, biology, and environmental sciences. Each delivered a seven-minute summary of his or her most recent research findings. The topics covered included cultural practices and veganism, irrigation and food security, farm subsidies, GMOs, cropland productivity and climate change, food contamination, food waste, the environmental consequences of meat consumption, and rural poverty in Africa. A complete list of speakers and topics can be found on our Speakers page (wcfia.harvard.edu/conferences/17_global-food-symposium/speakers). Following these presentations, Dr. Shenggen Fan (ifpri.org/profile/shenggen-fan), director general of the International Food Policy Research Institute (IFPRI), gave the keynote address. Dr. Fan offered his views on what scholars from our Boston-area research institutions can provide in the larger global effort to understand and improve outcomes in food and farming. He is an economist with degrees from Nanjing Agricultural University and the University of Minnesota, and has been director general of IFPRI in Washington, DC, since 2009. He was appointed by UN Secretary General Ban Ki-moon to the Lead Group for the Scaling Up Nutrition (SUN) movement, and serves as an advisor to many national governments, including China, on policy matters surrounding agriculture, food security, and nutrition. In 2014 Dr. Fan received the Hunger Hero Award from the World Food Programme. The conference conveners included a steering committee of both senior and junior scholars from Harvard, Tufts University, Boston University, and the Massachusetts Institute of Technology, with sponsorship from Harvard’s Weatherhead Center for International Affairs. For more information about food-related degree programs, courses, and events at these institutions, please visit our Partners page (wcfia.harvard.edu/conferences/17_global-food-symposium/partners). Visit the Program page for a list of speakers in order of appearance (wcfia.harvard.edu/conferences/17_global-food-symposium/program). Conveners William Clark, Faculty Associate, Weatherhead Center for International Affairs. Harvey Brooks Professor of International Science, Public Policy, and Human Development, Harvard Kennedy School. Rachael Garrett, Assistant Professor, Department of Earth and Environment, Boston University. Peter Huybers, Professor of Earth and Planetary Sciences; Co-Director, Harvard University Center for the Environment, Harvard University. Kelsey Jack, James L. Paddock Assistant Professor of Economics, Tufts University. Anthony Janetos, Frederick S. Pardee Professor, Department of Earth & Environment; Director, The Frederick S. Pardee Center for the Study of the Longer-Range Future, Boston University. William Masters, Professor, Friedman School of Nutrition Science and Policy and Department of Economics, Tufts University. Robert Paarlberg, Associate, Weatherhead Center for International Affairs. Betty F. Johnson ‘44 Professor Emeritus of Political Science, Department of Political Science, Wellesley College; Adjunct Professor of Public Policy, Harvard Kennedy School. Kenneth Strzepek, Research Scientist, Joint Program and CGCS, Massachusetts Institute of Technology; Adjunct Professor of Public Policy, Harvard Kennedy School.